Teresa Yu, Founder & Director of Amabile School of Music, enjoys her career as a soloist, chamber musician, educator, and a mother of two beautiful children. She has won several competitions including first prize at the New England Piano Teachers Association in 1999 and 2000, the San Francisco Young Pianists Competition, and the Berkeley Piano Club Competition, and the first prize in Mu Phi Epsilon Competition in 2007. Ms. Yu has performed the Bach Double Piano Concerto in Jordan Hall at the New England Conservatory or Music and the Beethoven Piano Concerto No. 1 at the Colorado College Summer Music Festival. As the winner of the San Francisco Conservatory of Music’s Concerto Competition, she performed Saint-saëns Piano Concerto No. 2 with the Conservatory Orchestra in March 2005. She was invited to perform the Rachmaninoff Piano Concerto No. 2 with Symphony of the Redwoods and the Liszt Piano concerto No.1 with Redwood Symphony. She performed in many master classes that were conducted by world famous artists such as Mstislav Rostropovich, Leon Fleisher, Richard Goode, Stephan Hough, Murray Perahia and more. She was invited to perform twice at the Kennedy Center in Washington D.C. as a part of the May 2005 and 2007 Conservatory Project. She also participated in Music@Menlo International Music Festival as a chamber music institute coach and the judge of Chopin Competition in San Francisco. From 2010 to 2012, Ms. Yu toured Europe and America with her piano trio, Aleron and gave numerous outstanding performances to people from all over the world. Pervious teaching experiences including Notre Dome de Victoires, West Portal Lutheran, Old Mill School and the Nueva School. 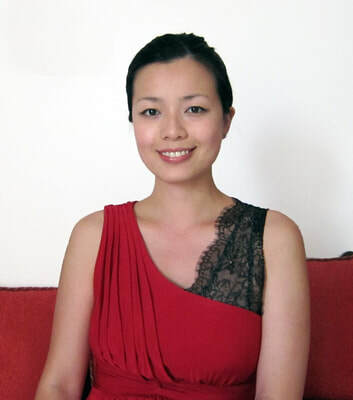 Ms. Yu has earned her Master’s Degree in Piano Performance and the prestigious Artist Certificate in Chamber Music at the San Francisco Conservatory of Music where she studied with Professor Paul Hersh. Ms. Angela Dwyer grew up in the west coast of Scotland and began making music at a young age. She graduated with a Bachelor of Music degree from the Ian Tomlin School of Music, Napier University, Edinburgh studying classical piano with Clare Sutherland, Simon Coverdale, vocal coaches Andrew Doig, Joan Busby and Jazz instruction from Eddie Severn and Haftor Medbøe. Angela also had the privilege to learn with Malcolm Martineau and BBC music producer Paul Hamburger whilst studying piano accompaniment at the Oxenfoord International Summer School. She travelled extensively as a pianist with Holland America Line for six years, all the while continuing her land career with performances in the United Kingdom and the United States. Angela holds over fifteen years of piano teaching experience, teaching students from 5-45 years old and has provided valuable music education to 4-11 year olds within the Scottish Education System. She believes in putting a strong emphasis on note/sight reading and has experience of both California Certificate of Merit and Associated Board for the Royal Schools of Music (ABRSM) examinations. One size does not fit all, and Angela finds it very rewarding to find new ways to connect, teach and inspire. Her aim is to make music education enjoyable and accessible to all. As a piano teacher and collaborative pianist, Jenny has worked with students of all ages and levels, and she believes in cultivating students’ interest in Classical Music and providing guidance for students should they wish to participate in musical performances. Her goal is to develop student's musical abilities and explore the music journey in a pleasant learning environment. Violinist Shaina Pan holds a Performer Diploma in Solo Performance, a Bachelor of Music in Violin Performance, and a Bachelor of Arts in English from Indiana University, where she studied with Austin Hartman and Grigory Kalinovsky. She is currently completing her graduate studies at the San Francisco Conservatory of Music with Ian Swensen. Shaina is passionate about playing music by living composers and challenging traditional paradigms of classical music performance. She has received Contemporary Performance and Ensemble fellowships from the Wellesley College Composers Conference and the Atlantic Music Festival. She recently performed in Mexico City with the IU New Music Ensemble as part of the grand opening of the IU Mexico Gateway at the National Autonomous University of Mexico. As a teacher, Shaina has experience with both group violin classes and private lessons at the IU Jacobs School of Music String Academy, as well as Fairview Elementary School in Bloomington, Indiana. Her teaching method is tailored to each student’s individual technical needs, but above all, it prioritizes physical freedom and a positive, non-judgmental environment. Born in St. Louis (b. 1993) and raised an Arkansas Native, Daniel De Togni is currently a pianist, music teacher and composer living in the San Francisco Bay Area. His works have been performed in Japan, at the Hot Air Music Festival in San Francisco, New Music on the Point, as well as being performed throughout the United States. Daniel has taught music to students of all ages as well as different styles such as classical and jazz. His teaching philosophy incorporates breaking down the complex process of playing and/or writing music into smaller components that can be solved through creative problem-solving as well as emphasizing musical imagination as a tool for the learning process. An extremely adept pianist, Daniel has performed in the United States as well as in Japan. He has performed many solo classical works from Rhapsody in Blue to Shostakovich's Piano Concerto No. 2 to Bach French Suites, as well as accompanying numerous works for various instruments, voices and ensembles. Among having classical performances, he is also an avid jazz musician and performs gigs frequently in the Bay Area as well as in Arkansas. Daniel also collaborates frequently with other artists in various genres. Ms. Esther Lam earned her Piano Performance Degree at the Santa Monica College in Los Angeles, where she attended under a scholarship. Esther has found her strong interest in Baroque performance practice and pursued her Bachelor's and Master's Degrees in Harpsichord Performance from the San Francisco Conservatory of Music. She has been very active in the SFCM Baroque Ensemble. Both as an instrumentalist and in collaboration with singers on the operatic and song repertoires. She had performed in master classes with Jeffrey Thomas, Kate van Orden, Antony Newman, Phantasm, and Rachel Podger. She performed as a harpsichord soloist in a 2009 production of Handel's Rinaldo and enjoyed her first orchestra appearance in 2010, performing Bach's Brandenburg Concerto No. 5 with SFCM Baroque Ensemble. In 2012, she won the Baroque concerto competition while she became a baroque accompanist at SFCM in 2013. Moreover, she has performed with several professional groups like the San Francisco Bach Choir, San Francisco Renaissance Voice, Musa, and continuously performed in summer festivals, including the American Bach Soloists Festival and Tafelmusik. In 2015, Esther had performed with famous AM1430 DJ for musical show and collaborated with a group of Hong Kong legendary singers for music concert at Los Angeles. Esther has been teaching music classes and piano lessons at West Portal Lutheran School & Clarion Music Center in San Francisco as well as music schools in Fremont and San Carlos. She also has been accompanying for many occasions including musical theatre works, musical casting, students’ concert/studio classes, church events and ceremonies at the bay area. She speaks fluent Cantonese, Mandarin & English. Originally from Cleveland, Ohio, Isaac Kay, started his piano study at the age of 7 and was enrolled in the Cleveland Institute of Music Preparatory College as a young person and was a member of the Cleveland Orchestra Youth Orchestra where he served as Assistant Concertmaster as well as other positions. While there, he had the opportunity to work with conductors such as Marin Alsop, Kurt Masur, Sir Andrew Davis, JaJa Ling, among others. He also had received his Suzuki Certifications from Level 1~8 at this time. He holds his Bachelor of Arts from Westmont College in Santa Barbara, CA, and his Master’s Degree in Music from The University of Denver. Isaac also studied abroad in Heidelberg, Germany at the Heidelberg Opera House. Mr. Kay has attended the Aspen Music Festival and School (’17, ’18) and was a student of both David Halen and Bing Wang while there. He served as Principal Second Violin for the Aspen Opera Center Orchestra, as well as performing in the Aspen Chamber Symphony as Assistant Concertmaster as well as other positions, in addition to the Aspen Festival Orchestra. Isaac has attended the Brevard Music Festival, Stringendo School for Strings, and Credo Chamber Music Festival, both studying and/or performing with Jay Christy, Peter Slowik, Jonathan Carney, John Nelson, Keith Lockhart, William Preucil, among others. Isaac has also performed with the Santa Barbara Symphony Orchestra under Nir Kabaretti. Mr. Kay has performed as concertmaster/assistant concertmaster on international tours to Europe giving concerts in Dvorak Hall (Prague), The Mozarteum (Salzburg), Vienna, across Italy, and has performed in Germany. Isaac’s teachers have included Rebecca Ensworth, Eugenia Poustryva, Yue Deng, Dr. Han Soo Kim, Thierry Stoeckel, Linda Wang, and currently Ian Swensen and Alexander Barantschik at the San Francisco Conservatory of Music where he is pursuing a Concertmaster-Track Professional Studies Diploma. Ms. Isabelle Wilson is originally from Switzerland, where she obtained her Certificate of Piano in the Conservatory of Geneva with awards. Ms. Wilson also earned her Bachelor of Arts in Spanish language and History of Cinema. Ms. Wilson earned her Master of Music in Piano Performance with awards in distinguished achievement, under the direction of Dr Victoria Neve and Dr Roger Woodward. To further her study, she graduated with a second Master of Arts in Education in 2013. Isabelle speaks French, Spanish, and English. Ms. Wilson has been teaching and accompanying in the bay area for many years. She was a teacher assistant for two years as part of the after-school program Music Team at the Elementary School Woodrow Wilson in Daily City. She is a regular accompanist for George Washington High School and Presidio Middle School. Ms. Wilson is passionate about teaching. She likes to build along with the student a solid rhythmic foundation, based on the Swiss educator Jaques Dalcroze’s principles. Each musical concept is taught thoroughly, based on the child’s comprehension and readiness. Each aspect has to be understood entirely before going to the next level. This educational structure is based on European pedagogues, such as Johann Heinrich Pestalozzi. Isabelle also believes in regular ear-training and rhythm exercises, in order to strengthen each student's musicianship. Her ultimate goal is to share her passion of music, as well as helping her students to become an independent thinker. Mr. Kai Lin served as adjunct professor and a piano accompanist for Department of Music at Elizabeth City State University, North Carolina, an adjunct teacher at Norfolk Academy, the Director of Music at the Trinity Evangelical Lutheran Church in Norfolk, Virginia, a piano teacher at St. Patrick Catholic School, piano accompanist and organist for Bellissima. A Women Choral in Tidewater area, Virginia. Mr. Lin studied in the Doctor of Musical Arts Program at the College-Conservatory of Music, University of Cincinnati, Ohio. He earned his Master of Music from the Ohio University School of Music in Athens, Ohio. He is a former lecturer in the Composition and Conducting Department and a piano accompanist in the Vocal Department of the Shanghai Conservatory of Music after he graduated. Kai Lin won the Excellent Education Prize for teaching in Shanghai Conservatory of Music. He received the Graduate Scholarship and Graduate Assistantships Awards from both Ohio University School of Music with national honors, and College-Conservatory of Music at the University of Cincinnati. Mr. Kai Lin made his organ and piano début in Cincinnati, Ohio, 1996. The program includes J.S. Bach's Fugue in G Minor; L.V. Beethoven's Piano Sonata, Op. 31, No. 1; F. Chopin's Etude No. 12 “Revolutionary”; F. Liszt's Liebestraum No. 3 in A Flat Major; C. Franck's Prelude, Fugue and Variation, Op. 18; L. Vierne's Carillon de Westminster; C. M. Widor's Organ Symphony No. 5, Op. 42. Kai Lin's composition and performance repertoire is extensive. His music compositions and recordings are published in USA and China. Kai's piano compositions have been very warmly received at numerous piano recitals. Mezzo Soprano & Pianist Breanna Miller is a current Graduate student at the San Francisco Conservatory of Music under the tutelage of world renowned Mezzo Soprano Susanne Mentzer. From Halifax, Nova Scotia, Breanna completed her Undergraduate studies at Dalhousie University, under the instruction of pedagogue Lucy Hayes-Davis, in 2014. Upon completion of her undergraduate degree, she operated a voice, piano, and musical theatre program at Maritime Dance Academy for several years. All participating students placed within the top 2-12% of the Royal Conservatory of Music Examinations, and many had placed in the Kiwanis Music Festival. Dr. Yi-Hsuan (Ethan) Lin earned his Master of Music degree in Percussion Studies from New York University and Professional Studies Diploma degree from San Francisco Conservatory of Music, where he studied with the prestigious principal percussion of the San Francisco Symphony, Jack Van Geem. In 2015, Dr. Lin earned his doctoral degree in Percussion Performance from University of Illinois at Urbana-Champaign, where he studied with Ricardo Flores and William Moersch. Specializing in marimba playing, his doctoral thesis is on the unique six-mallet marimba techniques in selected works. Dr. Lin’s concerto experiences include Alfred Reed’s Concertino for Marimba and Ming-Shong Li’s Chinese Drum Concerto with the school orchestras in Taiwan (2005 and 2007). As a soloist, he has performed numerous recitals and has been active in orchestra and ensemble performances. Recently, he was invited to perform Steve Reich's marimba ensemble work, Six Marimbas, with the San Francisco Symphony members for celebrating the composer's 80th birthday at Davies Symphony Hall. Dr. Lin had participated in various music festivals, such as Nancy Zeltsman Marimba Festival (2010 & 2015), Keiko Abe Marimba Academy (2013), and SoundSCAPE (2014). In 2007, he won the first prize in the percussion category of Taiwan Music Competition. In addition to performing, Dr. Lin enjoys teaching as well. Having plenty of experience coaching percussion ensemble and teaching private lessons, Dr. Lin recently teaches percussion lessons and group class in the bay area. His teaching philosophy is to make music enjoyable to students at all times! His wish for his students is to not only gain musical knowledge but also to feel the joy and peace which music brings to them. ​Brennan Strokes is currently earning his Master’s Degree in Music Composition at the San Francisco Conservatory of Music in the studio of David Garner. He graduated with a B.M. in Piano Performance from Pacific Union College in 2013, where he studied piano with Dr. Lynn Wheeler, voice with Bruce Rasmussen, and composition with Asher Raboy. Brennan is excited to spread his passion for music with those who wish to explore their artistic potential and believes that everyone is capable, and should find some way, of expressing themselves creatively.